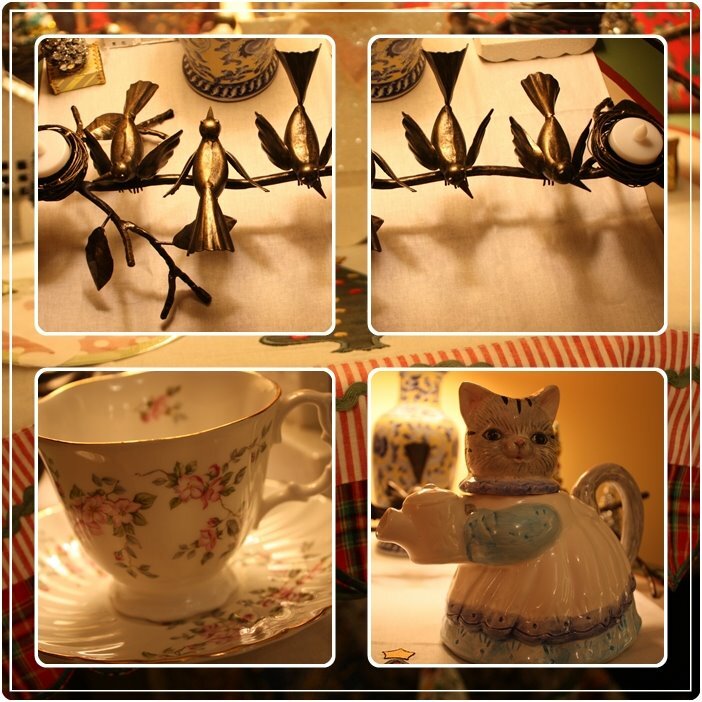 BARGAIN DECORATING WITH LAURIE: BE MY GUEST AT A CHRISTMAS IN JULY TEA PARTY! BE MY GUEST AT A CHRISTMAS IN JULY TEA PARTY! I am joining Felecia at Playing Dishes for a Christmas in July Tablescape Party. Are you ready to start seeing Christmas tablescapes? Maybe Christmas tablescapes can make us feel like it's not really as hot outside as the thermometer says. It's worth a try! Let's go check out all of the Christmas tablescape links on Felecia's blog, and just see if we feel that cold Christmas season air. Of course, at Christmas time, we give gifts to our friends, so I'm giving gifts to 3 of my guests! You know how all of these efficient bloggers have a giveaway when they reach 100 posts on their blog? Well, believe it or not, that has happened on my blog (only, it happened about 10 posts ago!) I was just posting away, without looking at the number of posts. When I started looking for a picture of a Christmas table, so I could participate in this event, I was shocked to realize that this would be my 111th post! Never thought I'd make it to 100, and now I've passed 100 and didn't even know it! 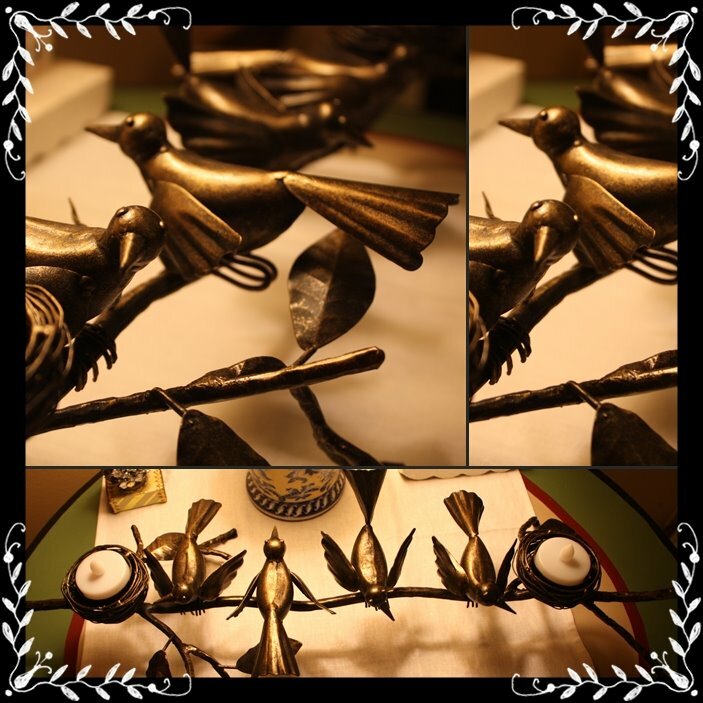 One of my tea party visitors will receive this bird votive candle holder. 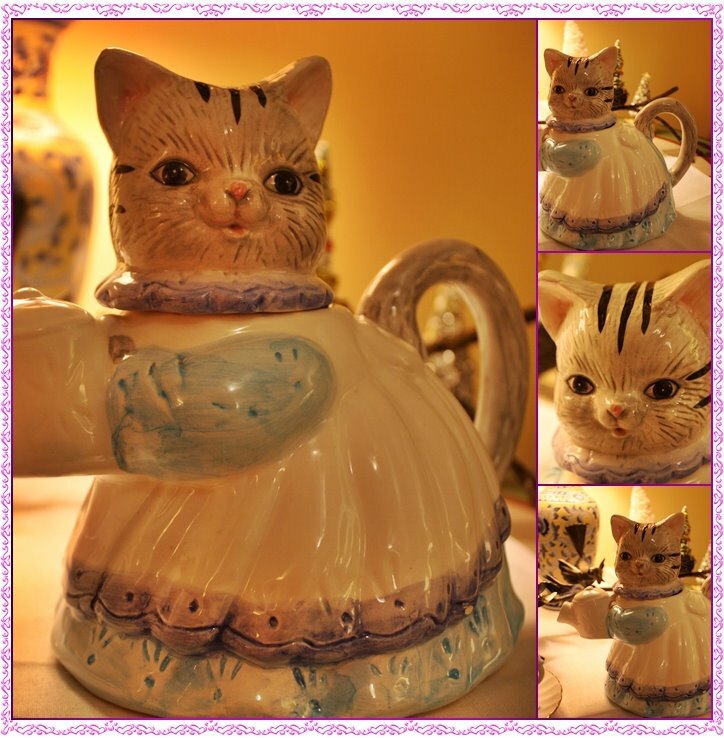 Another guest will receive vintage Miss Kitty. She looks like she is watering the garden with her little water can, but she's really ready to pour tea for your next tea party. 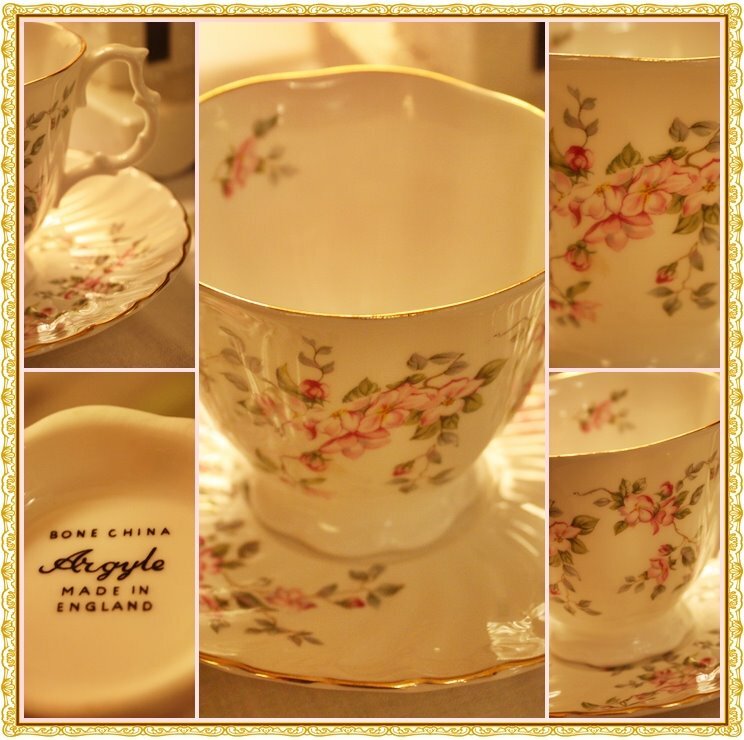 And finally, a third guest will receive this vintage teacup and saucer. If I had done a giveaway on my 100th post, I would probably have just given away one gift, but since I passed that milestone before I realized it, I felt I had to do a little better than one gift. I really wish I could send something to every person who leaves a comment on my blog. You are such special people, and I would never have made it to 111 posts without all of your encouragement and kindness. All you need to do to have a chance to be one of my winning tea party guests is leave me a comment to let me know you were here. If you would like your name put in the drawing for a specific gift, please tell me in your comment which gift you would like to win, and I will put your name in that drawing only. On Tuesday, July 14, I will draw 3 names, each of whom will win a prize. If you don't have a blog, please leave your email address, so that I can contact you if you win. I had my Christmas in July excitement today! I received a painting by the very talented Fifi Flowers at Fifi Flowers Design Decor! I was SO excited and SO flattered when she painted a picture of my picnic basket in my posting for the White Tablescape Party hosted by Cuisine Kathleen a few weeks ago! I had to have that painting, and it arrived yesterday. Thank you Fifi! It's beautiful! Isn't it wonderful? I am so proud to have it, and I can't wait to frame it. Don't forget to go to Playing Dishes and find links to all of the Christmas tablescapes in Blogville today. laurie THANK YOU FOR COMING BY MY BLOG. SORRY, BUT REGISTRATION FOR PRIZE DRAWINGS ENDED AT 5:00 TUES., JULY 14, 2009. What a lovely table. I am so glad that you participated today. Your cookies did make me hungry and I don't think I have anything sweet in the house! The rest of the food look wonderful, too. I love the tree used for a centerpiece and the dishes are so cute. Are these from Pottery Barn? I found a set of four of the cute little reindeer like this during the past week while thrifting. There were dinner plates and the dessert or salad ones, but only for four of the reindeer. I bought them and came home and was looking to see if I could find the others. I found some on ebay that said they were from Pottery Barn. Mine don't say that on the bottom and I assume they would be labeled with the name. Anyway, they are really cute. I wish I had the other reindeer. Thanks for stopping by. What a thrill for the guests to have a chance at your drawing, too. WOW! Your post is just great. You are so lucky to have that painting. We will be anxious to see it framed. Congratulations on your 100th. That is quite an accomplishment. I would love to win the birdie votive. Thanks for all you share with all of us. I love Fifi's painting of your picnic basket. Isn't she fabulous?! Congratulations on your 100th post and 111th post. What a generous giveaway. Congratulations is in order then! I haven't check if i reach my 100th post...this is exciting! Miss Kitty looks so sweet! Those reindeer plates are adorable! Fifi's painting is so pretty! 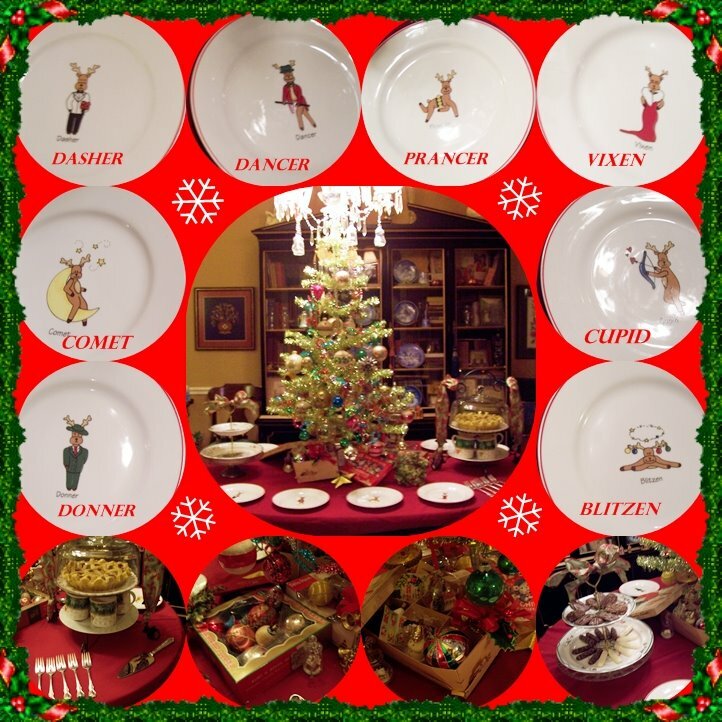 Laurie, I am not quite ready for Christmas, however your reindeer plates are soooo cute! I love the painting you got from FiFi. Please include me in your giveaway, please! HOW EXCITING to have Fifi's painting. She does such a fabulous job, doesn't she? Yes, please add me to the giveaway hopefuls... :-) Who knows, maybe I'll get lucky! 111..well congratulations. I didn't give anything away for my 100th...you are shaming me into it! I think this was my 111 too! Love your collage of Christmas beauty, all new to me as I hadn't met you yet! I am eying that pretty tablecloth with the rick rack..did you make it?? Your pic from Fifi is fantastic..lucky you! Your giveaway gifts are great! I would love to win any of them. . .
Love the Fifi Original .. It's beautiful.. Love those birdie tealight holders! I love the tablescape and also love the painting! Hello Laurie, what a great idea, your Christmas in July tablescape and mosaics are gorgeous, I really like your bird candle holder and reindeer plates. Congrats on your 100th and 111th posts, your giveaways are beautiful and talking of beautiful Fifi's painting is perfect. happy Christmas in July, Kathy. Wow you have so much going on in this post! 1. Loved your Tea table at Christmas! So I really love it in July! :) I'll be zipping over to Playing with dishes to see the rest of the pretty tables. 2. Congrats on the big 100 and 111! I'll be doing a giveaway on Monday for my one year that was last month! hehehehe LOL! This was a fun idea for an event. Since I have not properly put away my x-mas decorations in the basement I should have joined! Congrats on reaching your 100th post. The cookies were actually pretty good. shopping. Want to come? Can you drive over one for a blogging outing? There's also another lady that evidently lives in Memphis too! Wouldn't it be fun? Whatcha think? Let me know! Goodness those Christmas pictures were lovely! I adore the painting too! I I love your Fifi painting! I know you're delighted. I don't have any pictures of my Christmas tables - so I've got to scrounge something up without a trip to the hot attic. Your's is truly delightful -- Congratulations on your post #100, #101, #102, #103, #104, #105, #106, #107, #108, #109, #110 & #111! I know we enjoyed them all. Anyone should be proud and honored to receive any one of your giveaways. Congrats on reaching a milestone. I am approaching my blogiversary (is that how you spell that). Can't believe I started doing this almost a year ago. BTW, I love your vintage aluminum Christmas tree. One more thing (and no, I'm not just trying to get in the drawing twice, although that wouldn't be a bad idea). Did Fifi just happen to choose to paint your picture? I think her artwork is simply wonderful. Such talent! well your advice was too late.i had already nearly broken a tooth.you see,i had already snuck a cookie before i read those were last Christmas"cookies.oh well,that'll learn me,won't it? it all looks fabulous.congrats on your 100th milestone.all your prizes are fabulous.great choices.of course,add me in.any of them, anyone would be proud to own. i love you too you sweet heart you.yes,my faith in the hospital is strong again.i know now they are just super-super busy saving lives. my appt for the cath is at 7:30.but...i have to call between 5:30 and 6:30 mon to make sure.he is so busy it may shift one way or the other.wow.can you believe that? he is so gorgeous and i am sure talented i can see why.he looks like a movie star.really. i have not seen my surgeon yet.i am suppose to meet him Tues.or thats what my co-ordinator says happens alot.he comes in after the cath and tells me if there is no problems and when he will do my surgery. It's funny seeing Christmas when it's so hot out, but I love it. I am in Vegas housesitting and it's 108 right now. Whew!! I would love to be in your drawing for the giveaway. Laurie Congratulations and thank you for your pretty giveaways! I would love to be entered please! Laurie, Thank you so much for your prayers! I know God is working. My rash is calming down somewhat- now working on trying to get rid of a massive yeast infection from the massive doses of antibiotics. Go to Dr Fri for big toe check (where I got the rattlesnake bite)- am hoping he will let me get from under the "house arrest" He is hopeful that I will not need additional surgery on the toe due to the dead skin. wonder if my feet will ever look pretty again!! Just thankful I still have the toe and am asking God for patience to stay in my chair till Friday !! Just keep thinking of all those projects and you know I don't have that breakfast nook finished yet! Am I too late to enter? Those are all great presents but I think I am fondest of the teacup! I'd love to enter that drawing. Fifi did a great job on your painting. I'd love to see another photo of it when you have it framed! Oh Laurie, I am just thrilled for you. Your very own painting of some treasured items in your home. FiFi does a great job ! I am so happy for you. You work hard setting up your blog and am so thrilled for you. Well deserved !!! Hey, I'd take those Christmas cookies any time of year! A Christmas in July? What an excellent idea. It's a nice mid year to look back on previous Christmas Season and think of the wonderful memories. At the same time, it is a wonderful time to look forward to the coming Christmas Season - well, it's never to early to think and prepare for it, I think LOL. And you certainly celebrated Christmas on this post! Congratulations on you 111th post! And many more fun posts to come! Congratulations on yours 110th post! How much fun it has been too. And you are having a giveaway thats soooo nice! I love all your giveaway gifts. Please put my name in your giveaway and good luck to me...well...everyone..
Hi Laurie...I have been trying to leave you a comment for days but the comments page wouldn't ever load. After running a spy check, clearing my cookies & defragmenting, I was finally able...woohoo! How lucky you were to receive a pianting done by Fifi & I really enjoyed your 4th of July decor. Happy is the blogger who bypasses a bloggy milestone! You just love to write! All of the treasures are lovely but I am particularly crossing my fingers for the teacup. Laurie...thanks for all of your prayers for Connor and his family...it means the world to me that you are praying for them...I know they can feel the love we all are sending their way!!! I have had so much fun visiting here today!!! This is such a fun meme!!! I really wish it was Christmas time and we could escape this terrible heat!!! Your tablescape is gorgeous and I love the way you showed it off in your mosaics!!! The picture from Fifi is a dream...I wonder if she would do one for me?!!! I love it!!! What a great idea to have Christmas in July! So fun, and brings back good memories. Oh, you are one lucky lady to have a painting from Fifi! She sure is talented. Please do enter me in the giveaway! The bird votive holder is my favorite, and next fave is the pretty teacup and saucer. Sorry I am so behind on blog visits. I am having so much trouble with this old computer. Takes so long for pages to load and it freezes up all the time too. Everything looks wonderful- including your blog. The bird votive is awesome. Congratulations on your 100th. I thought you'd passed that long ago because it seems as if we've been friends for so long! I love Fifi's gift too! She's so talented and you deserve it. I would just love to win any of those sweet things!! I still haven't tried to make a mosaic yet....maybe next week....we'll see. Those reindeer plates are so cute. I think it's so cute that they matched their names to a personality trait. Am I the only one who never thought of Vixen as a hottie, or Blitzen as being blitzed out? Congratulations on reaching your 100 plus post. All of the give aways are so cute. I think I would love the tea cup and saucer the most. I picked up some Christmas china and goblets at Salvation Army. I think I may do a tablescape using those. Blessings. You won a gift! Wow, and a great one. Seriously, I would love to be entered into your giveaway. They are all great gifts. But as I have started to do...I congratulate the winners now. In my 18 months of blogging I haven't won anything!!! My 300th post is coming soon, can you believr it. I love your painting! It's so pretty! Congratulations! You left a comment on my blog saying, "The press is so cute with that precious picture on it, and I love the way you've put them on the pretty pages. They look lovely. After you press them, do you glue them to the pages? I'm kind of slow and might need a little more toutoring on this subject!" Yes, I just used Elmer's Glue. I read that the "pros" use it! Congratulations on your 111th post! Fifi Flowers work is always so pretty...you're a lucky gal. Laurie.. congrats on passing the milestone 100 mark..girl I believe I have too..oops!!! Must do something special huh? What a beautiful table..not quite ready for Christmas yet..the year is already moving to quickly, too many changes for me to take in the way it is..You know I would love for you to enter me in your give away.. each and every gift is beautiful, I would love any of them, but you know how much I love bird things, I believe that would be my first choice,but if I was lucky enough to win the tea cup would be wonderful to have as well. Each and every time I would use it, I would think of you and our friendship.. you have always been so supportive and so kind... I pray things are well your way.. THANKS for showing YOUR painting by ME!!! Miss BARGAIN girl... you might want to let your readers know I NOW have a NEW BARGAIN PAINTING site!!! http://fififlowers.com and click on "BARGAIN PAINTINGS" in my blog header!!! Hello Laurie - would love to enter your sweet giveaway! You know how much I love birdies! Hope I'm not too late. Your Christmas table looks fabulous! Boo hoo!!! I missed this blog party. But I loved seeing your Christmas tablescape. And I love the items you are giving away. Congrats on reaching a blogging milestone. 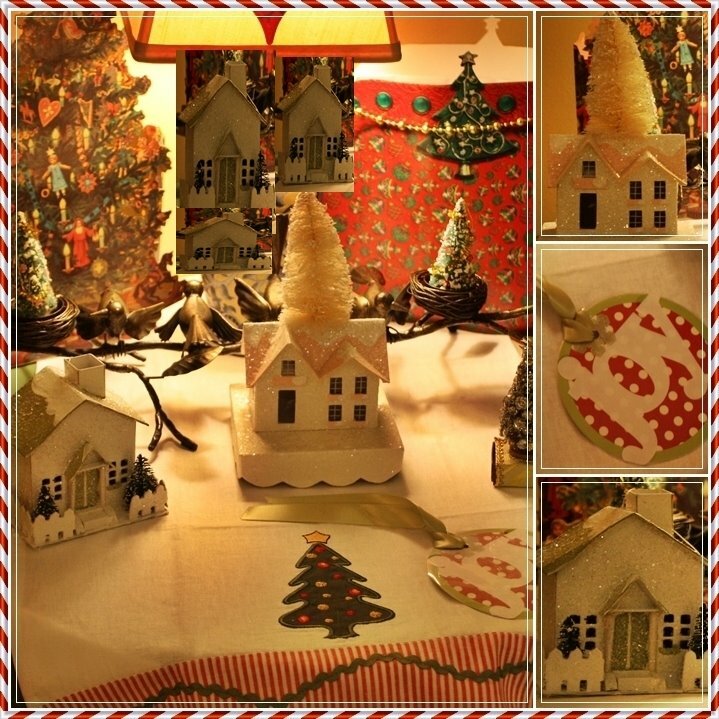 You know i love this blog..and I love Christmas in July..those little houses are so cute..I have a small collection myself(surprised? )..Is it too late for the sign-up for the drawing? Sign me up, if it isn't!.. It all looks so wonderful...and congrats on 111!!!! Fifi's art is fabulous! How beautiful! Congratulations on reaching & passing 100 posts! That's a beautiful table and those little glitter houses are just darling! Great reindeer plates! I haven't seen anything like those before. Congrats on your 111th post! I'm too late to get in on your draws for the lovely prizes but I think it is great you've done that many posts when you work full time. I know I find it hard to post/comment as much as I would like due to work. I love your new painting! Christmas looks wonderful, as hot as it is here! Congratulations on over 100 post! I been just doing one post a week these days. Had my four grands for 3 weeks. All under age of five. I had no time to vist! I been to Doc. I begged for time to get better, as I gone backwards this last month. I will be having a major, major surgery with two doc doing it and out 9- 11 hours. I am having one I do not want,as things can go down hill from it. But I get the summer off. Surgery is scheduled for mid September. Love your gifts! I loved the girls drawing it so much!